ArtWatch is entering its twenty-first campaigning year with strengthening critical bite. The new ArtWatch UK website greatly extended the published reach of our Journal (see Figs. 1-4), attracting 22,000 visits in its first year and 52,000 visits last year, half coming from the UK and the USA and the rest from 139 other countries. With this post our archive comprises 59 articles by 8 authors. In New York the ArtWatch International site has been revivified under its new director, Einav Zamir. In France our colleagues in the Association Internationale pour le Respect de l’Intégrité du Patrimoine Artistique (ARIPA) have re-structured their website which now carries much of the contents of their excellent, rigorous journal, Nuances. Our efforts now attract fewer hostile and more respectful responses. We enjoy (sotto voce) support at high levels in many quarters – including among some conservators – and we sometimes earn outright vindication, as shown below. International and national press interest in our campaigns remains high. 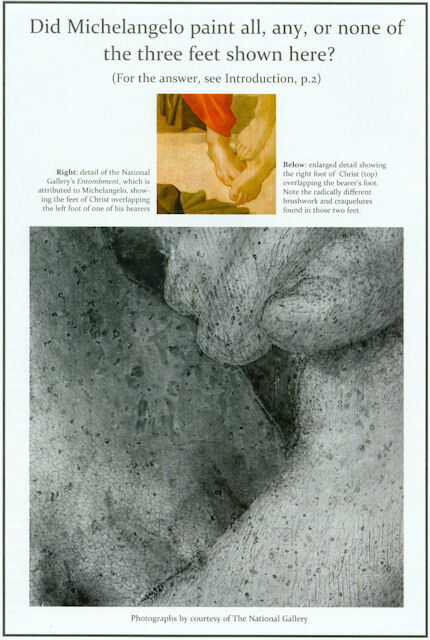 Unfortunately, in the art world itself many players remain in official denial on the subject of restoration injuries. They can see and admit that this is wrong and that that is wrong, but not that pictures are still being injured in restoration. Our second post on the 13 December 2010 (“An Appeal from Poland”) drew an immediate response. Distinguished scholars, curators and conservators in Poland had asked ArtWatch UK to support their opposition to a proposed loan of Leonardo’s “Lady with an Ermine” to the National Gallery (see “The National Gallery’s £1.5bn Leonardo restoration”). We were then attacked in Poland – abusively – by Count Adam Zamoyski, chairman of the Princes Czartoryski Foundation which had agreed to loan the many-times borrowed Leonardo for a substantial fee. 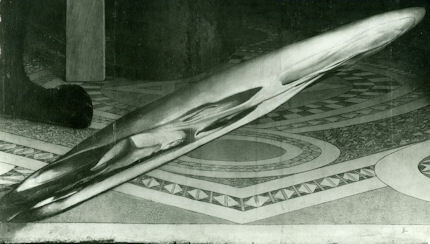 It was later reported from Poland that: “In order to improve the functioning of the Foundation of the Czartoryski Princes and to assure the correct collaboration with the National Museum in Krakow”, Prince Adam Karol Czartoryski of the Czartoryski Museum had dismissed the entire board and its chairman, his cousin, Count Adam Zamoyski. 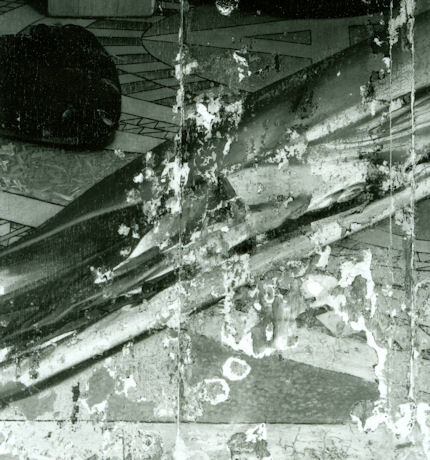 Although the contracted loan went ahead it was announced that the fragile panel painting would not travel again for at least a decade. Our posts of 8 February and 14 March 2012 produced evidence of a mis-reconstructed sleeve of Christ in Leonardo da Vinci’s “Last Supper”. This was reported in the Independent of 14 March 2012. In the National Geographic special issue “Exploring History” it is said that: “Generally lauded by art historians and appreciators, the restored work has aroused controversy. Some say too little of Leonardo’s paint is left, or cavil about the mural’s altered forms…As the debate wears on, we at least – and at last – have a legible ‘Last Supper’ to savor.” “Legible-but-false” could stand as a motto in those museum conservation departments where restorers paint photographically manipulated “virtual realities” onto old master pictures. In our next post we examine the consequences of the last restoration and its contributory role in the present crisis – a crisis for which the blame is brazenly being shifted by the authorities from the authorities and on to the (paying) visitors. 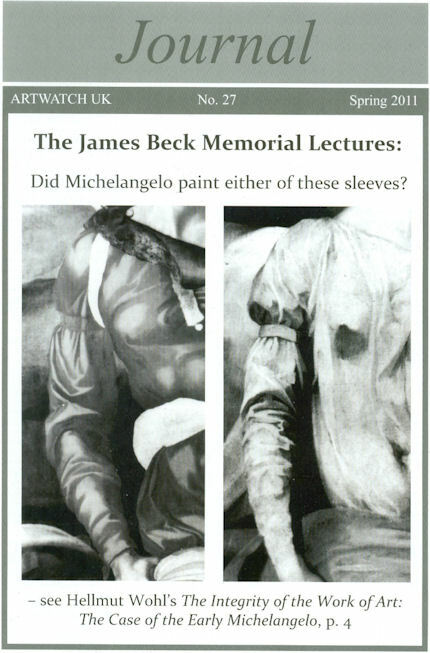 Above, Fig 1: The front cover of ArtWatch UK Journal 27, showing (left) a draped figure in the National Gallery’s Entombment, which is attributed to Michelangelo, and (right) showing a figure (reversed) from the later Marriage of the Virgin by Rosso Fiorentino. Above, Fig. 2: The back cover of ArtWatch UK Journal 27. Above, Fig. 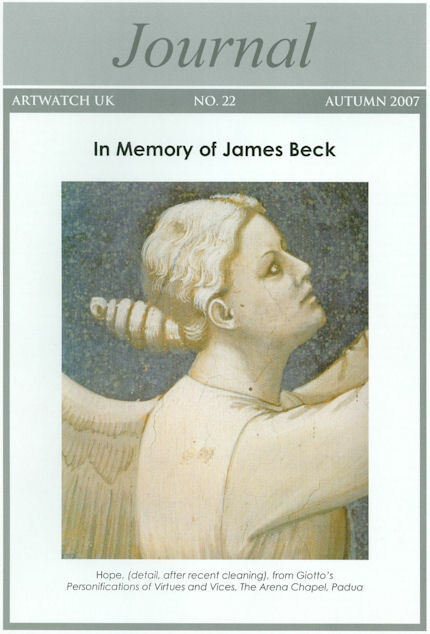 3: The front cover of the commemorative ArtWatch UK Journal 22. Above, Fig. 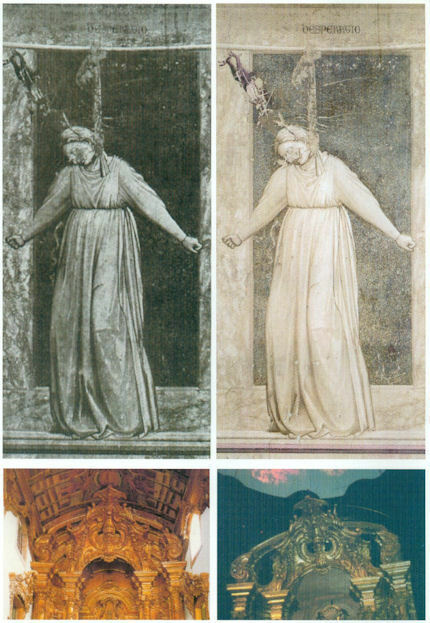 4: The back cover of Journal 22, showing, top, Giotto’s Despair before (left) and after (right) restoration, and, bottom, the gilded altar from the Benedictine church of Sao Bento, Olinda, Brazil and, right, when moved (temporarily) to the Guggenheim Museum, New York in 2001, after restoration. Above, Fig. 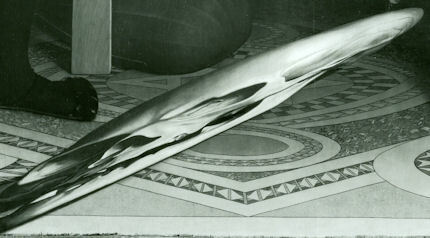 5: A detail of the anamorphic skull in the National Gallery’s Holbein The Ambassadors, when being cleaned during the Esso-sponsored, BBC-filmed, 1993-96 restoration. Above, Fig. 6: The anamorphic skull in Holbein’s The Ambassadors before cleaning and reconstructive repainting at the National Gallery. This entry was posted on January 10, 2013. It was filed under blog and was tagged with Andrew Manze, Antonio Paolucci, ARIPA, ArtWatch International, ArtWatch UK Journal, Count Adam Zamoyski, Einav Zamir, Gerry Bell, Leonardo da Vinci's Last Supper, Lufthansa Lecture 4, Michelangelo's Sistine Chapel frescoes, Prince Adam Karol Czartoryski, Prof. James Beck, The Czartoryski Museum, The English Concert, The helsinborg Symphony Orchestra, The Princes Czartoryski Foundation.